Not all exotics have problems with their teeth, but hamster teeth can cause problems. Hamsters, like some other exotic pets, have the type of teeth that grow continuously throughout their lives. These teeth may periodically require tooth trims if your hamster doesn't wear them down himself. Herbivores such as rabbits, and omnivores like chinchillas and hamsters, have long teeth that continuously grow, often requiring tooth trims. These teeth are called hypsodontal teeth. Hypsodont teeth have crowns (the part of the teeth you can see) that extend a great length beyond the gums. Therefore hypsodontal teeth are unusually long when compared to the teeth of dogs, cats, or humans. The natural grinding action of chewing on toys, hay, and other food items, causes the teeth to stay at an ideal length in normal herbivores, but many need to have their teeth manually cut on a regular basis due to a number of health and genetic factors. The incisors, or front teeth, of your hamster, are the easiest to identify when they become overgrown. They will usually grow so long that they begin to curve and stick out between the lips. Once they get too long they can become stuck on things, or worse yet, grow into the gums or roof of your hamster's mouth. The molars, or teeth in the back of the mouth, can also reach excessive lengths, but in hamsters they rarely become overgrown. Molars are difficult to observe without the use of a speculum to look in the back of the mouth, but hamsters with overgrown molars will commonly hypersalivate and have difficulty chewing and swallowing. If done correctly, tooth trims are not painful. Since hamster mouths are so small, a dremel tool is not safe to use as it is for larger herbivores such as rabbits and chinchillas. A pair of suture scissors or small nail clippers work to clip the overgrown incisors. Care should be taken not to clip the teeth too short which will cause pain and possible trauma to the teeth. Many exotic pet hospitals will perform these tooth trims inexpensively with a technician or a doctor. Trimming molars can be more difficult than trimming incisors and thankfully doesn't need to be done very often or at all. Molars are not as easily identified as being overgrown, so the pet is usually already being seen by a veterinarian by this point. After the veterinarian confirms that your hamster's molars are too long, they may be able to trim them with the pet awake using a surgical instrument designed for bone or tooth removal called a rongeur (interestingly enough, the word "rongeur" is French for "rodent") or a tooth-specific instrument. 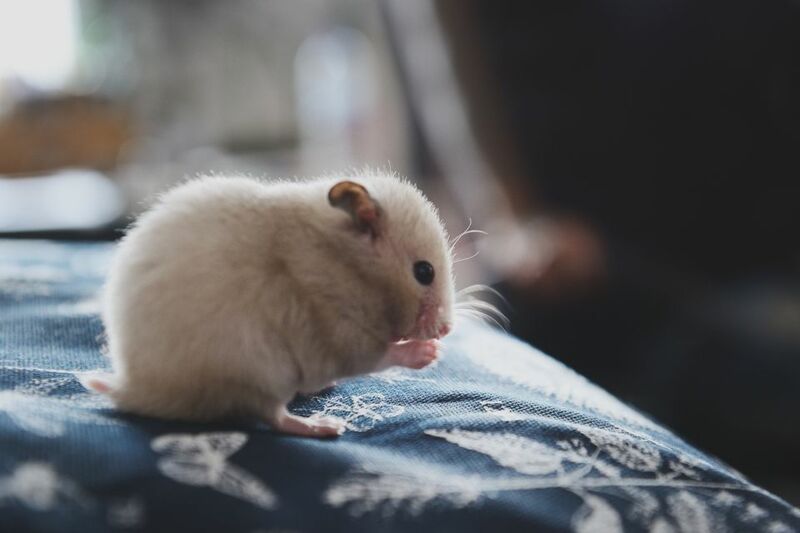 If your hamster allows them (although they typically don't), and the veterinarian can grasp the correct tooth, the overgrown portion is simply snipped off. There is a possibility for trauma, but unlike dog nail clippers, rongeurs are much sharper and don't usually cause any damage. If the trimming is too complex or the pet is too fractious (which is probably going to be the case for your hamster), anesthesia or sedation can be administered to perform the trim. With your hamster temporarily incapacitated, the molars can be trimmed and filed down to an appropriate length. This is the ideal method of trimming molars, but some owners may have financial constraints that restrict them from anesthetizing or sedating their exotic pets. Owners of hamsters and other exotic pets with hypsodontal teeth must be aware of the possible complications regarding their pet's teeth. Without the proper attention, overgrown teeth can cause serious trauma, anorexia, and even death from the inability to chew and swallow. Thankfully the problem of overgrown teeth is easily controlled with regular tooth trims and proper chewing behaviors. But if you need help with your hamster's teeth, give your local exotics vet a call.